The beginning of the year is always the time companies implement changes to policy, direction, or realignments to what is important. It can also be the time to embrace change and not just go along with it but lead through it. Incoming mail: We will be selecting a mail box forwarding vendor that all of our incoming mail, excluding client invoicing, will be scanned and emailed to us. 100% of the mail will then be shredded and recycled. Client invoicing: We have already been invoicing via email for a couple years but soon we will only accept electronic payment delivery. Credit card, bank wire, or a check delivered directly to our banks lockbox. Internal documents: As a sourcing firm, the sheer number of resumes alone could be enough to represent thousands of dollars in ink and paper. We will use devices like iPad’s with applications like Dropbox or Box to instantly share resumes around the office. Signing official documents: A lot of times a client may require an official government form to be signed and returned to them. However, there are great applications for iPad like Signmypad that allow you to add an original signature to a file. If we need something signed we use Docusign to get the document executed. Paper products in the office: No more disposable cups, we will use a dishwasher and hard mugs for coffee and such. We have located a vendor to provide milk in recylable glass bottles and all of our other products in the office will either be fresh or in a recyclable non-paper container. 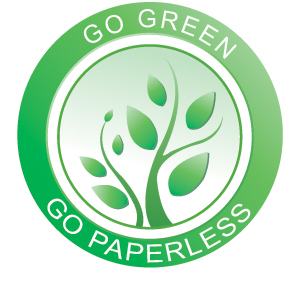 Although different types of companies may not be able to go completely paperless we think we can all do our part to reduce our paper usage, ink usage, and help the environment.